Tin House Books, 9781941040898, 336pp. 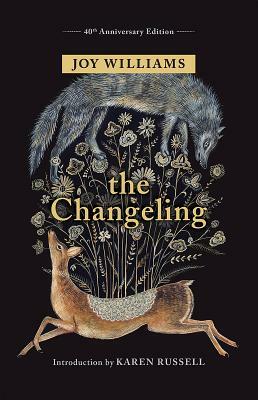 Forty years later, The Changeling is no less haunting and no less visionary than the day it was published, but it has only become clearer that Joy Williams is a virtuosic stylist and a singular thinker--a genius in every sense of the word. When we first meet Pearl--young in years but advanced in her drinking--she's on the lam, sitting at a hotel bar in Florida, throwing back gin and tonics with her infant son cradled in the crook of her arm. But her escape is brief, and the relief she feels at having fled her abusive husband, and the Northeastern island his family calls home, doesn't last for long. Soon she's being shepherded back. The island, for Pearl, is a place of madness and pain, and her round-the-clock drinking spurs on the former even if it dulls the latter. And through this lens--Pearl's fragile consciousness--readers encounter the horror and triumph of both childhood and motherhood in a new light. With language that flits between exuberance and elegy, the plainspoken and the poetic, Joy Williams has blended, as Rick Moody writes, "the arresting improbabilities of magic realism, with the surrealism of the folkloric revival . . . and with the modernist foreboding of Under the Volcano," and created something entirely original and entirely consuming.